We were blessed this past weekend with beautiful un-Winter-like weather, and my friends and I were excited to take advantage of the high-sixties temperatures by participating in yesterday’s event. What makes the Turkey Shamble different from other golf events? For one thing, it is held in mid-November during normally frigid Wisconsin weather. Most notably, though, it is the only area event that allows golfers to drive their own cars on the course. Except for on the par five sixteenth hole, Muskego Lakes has a continuously running cart path that when followed will keep cars and carts off the grass entirely. Our team consisted of two of my best friends, Jason and Jeff, and friend and golf consigliari, Nelson. Jeff is a member at Muskego Lakes, an excellent driver of the golf ball and consistent short game player. Nelson is a student at UW-Milwaukee and manager of a local Golf Galaxy. His help with club-fitting and my overall game over the past year has been invaluable. Jason is a consistent player and excellent putter. We figured to have a pretty competitive team. Nelson texted me the night before that the winning team on Saturday finished at -22. I relayed this information to Jeff, who responded, “Well sign me up for a good time, then.” Deal. Jason and I got to Muskego Lakes at 8:15, hoping to get in a few swings. The driving range was out of commission, though, as it would be used to set up cars for the day’s event. We opened the tailgate of Jeff’s Honda Pilot and laid all four bags in with the clubs facing outward. Our super-charged golf cart was prepped and ready to go, so we hit the putting green and got a feel for the speed, which was pretty quick for November 11. Our round started out well when my tap-in eagle on our first hole, the par five dogleg left twelfth, had us on pace early for a final score of -36. I somehow avoided tweeting this fact, and we moved on to our second hole of the day. The par three thirteenth is 165 yards and played straight in to a 25-plus mile per hour wind. Hitting long irons, no one was able to get near the green and we carded three bogeys, bringing our score up to +1 and above par where we would remain for the day. Long-time Milwaukee Journal Sentinel golf writer, Gary D’Amato, caught up with us on the tee box at thirteen, which was a bit of a thrill for me as a fellow golf writer and reader of his articles for many years. He joined us for several holes, asking questions about the event, talking about Wisconsin golf and, of course, the Packers who were on a bye. 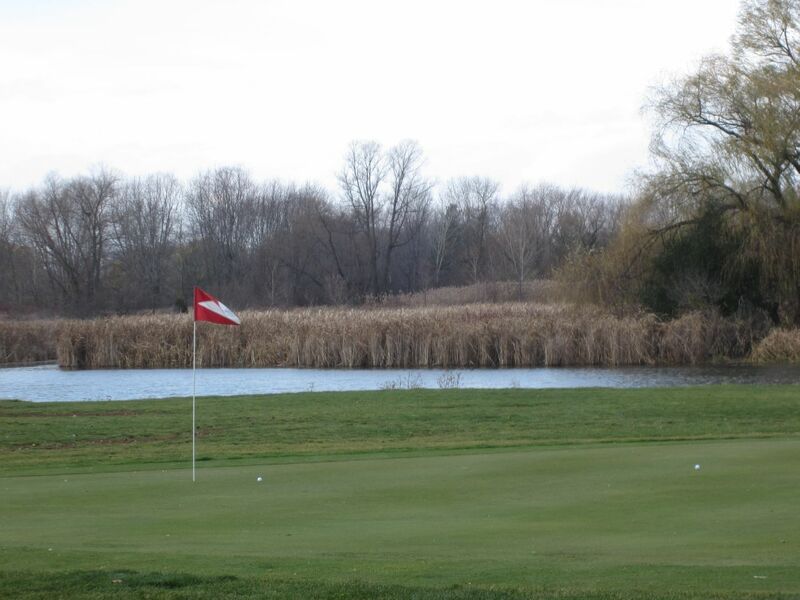 The strong, swirling winds at Muskego Lakes seemed to be directly in to us on every hole. On most tee boxes, someone would say, “Well at least we’ll have the wind on the [seventeenth] hole.” Nope, straight at us again. The wind would prove to make for an incredibly challenging day of golf for our team, as we finished in tenth place at +7, but a great time was had by all. The winning team on Sunday finished at -8, while the team who shot -22 the day before (including Nelson’s dad) finished at -7. It’s cool enough that I’m looking forward to making the Muskego Lakes Car Shamble an annual event in my own golf season.